Previous Post: It was just one of those days Next Post: A Farewell to Arms – Finally! In our sixties, (Don’s now seventy-two!) with apparently no other authentic option, my husband Don and I sold our car and apartment, sold or gave away all our stuff, and set off to discover the world. And ourselves. We started in Italy in 2011 and from there have travelled to Spain, India, Bali, Australia, Southeast Asia, Sweden, Mexico, South America, etc. – you can see the blog archive. We will continue travelling until it’s time to stop – if that time ever comes. So far it suits us very well. We are interested in how the world works, how life works, how the creation of experience works, how the mind works. As we travel and both “choose” our course, and at the same time just let it unfold, we discover the “mechanics” of life, the astounding creativity of life, and a continual need to return to trust and presence. Opening the heart, and acceptance of what is, as it is, are keystones for us both. Interests: Alison – in no particular order: travel, figure skating (as a fan), blogging, photography, acceptance, authenticity, walking/hiking, joy, creativity, being human, adventure, presence, now. Don – the same except replace figure skating with Formula One motor racing. To discover more read the article we wrote for Retirement and Good Living: The Gift of Travel. Also an interview we did with Nomadic Matt. Also please check out our Adventures in Wonderland blog. Don turned 65 in October 2007 and thoughts of wanting to retire and travel more began to take precedence over his former enthusiasm for his work as a private-practice neuropsychologist. However, because of some very poor financial decisions we’d made a couple of years earlier he was not in a position to retire, so he recommitted himself to continuing to work until he was 70. By May 2011, now 68, he was almost at the end of his tether. He had begun experiencing problems with his heart and with his mental abilities. He had no enthusiasm left for his work, but could not see a way out of the dilemma: continue to work to maintain our current lifestyle and do a little travelling, or retire and live a very restricted life with little or no opportunities for travel. He was feeling constantly worried and anxious about money and financial security. So that’s what we did: we put our beautiful apartment on the market. It sold quickly, right at the peak of the Vancouver housing market that year, and we made more than we’d originally expected after paying off the mortgage and other debts. We sold our car and sold or gave away most of the rest of our possessions. It was an amazingly freeing experience. By September 2011 we had put our few remaining possessions into a 500 cubic foot storage unit and were ready to begin travelling in earnest. That fall we went to Italy and Spain. For the first time Don didn’t worry about how much we were spending, we just wanted to have the best possible time. 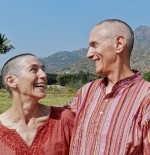 We had similar bucket lists, places we’d always wanted to see: Italy (especially Tuscany), spending an extended period meditating at Ramana Maharshi’s ashram in Tiruvannamalai, India, and exploring the island of Bali. We did all of these things and more in the first six months of our travels after we sold our home. In the past two and a half years since we became nomadic we’ve also been to Sweden, made another trip to India, traveled all through Southeast Asia (including Thailand, Cambodia, Laos, Vietnam and Myanmar), traveled around Australia, spent a few months in a seaside village in Mexico, and are currently spending six months travelling through South America, including Argentina, Chile, Bolivia, Peru, and Ecuador. The greatest gift in all of this travelling has been the inner growth that has come about for both of us. Travelling all the time has taught us to be much more flexible in our thinking and much more accepting of whatever happens, regardless of the consequences. It has also given us a much greater trust in the wisdom of the universe: to trust that we are always being guided to whatever is next. The more we travel the more we appreciate that unseen hands are supporting us the whole way, and so we live by intuition, feeling the way by the tips of our fingers. We’ve learned the miracle and power of gratitude. We’ve learned that people are the same the world over and that openheartedness is almost always responded to with openheartedness. It’s so great to read about your experiences here. Even though I read Don & Alison’s blog a lot, it’s funny how a little jolt ran through me when I got to the end of “things we’ve seen and done.” And I as all “I remember that post about riding a boat under the falls in Argentina.” As if in some way I had experienced it with you. Oh I remember that post *and* that boat ride! It was pretty exciting. Good to hear you felt as you’d experienced it too! What a marvelous inspirational couple Don & Allison are. I’ve been following their blog now for close to a years. A better travelog cannot be found. A better inspirational site cannot be found. They are a treat to read. So happy to see them featured here. Thanks so much Paulette for your wonderful compliments! Hi Leni, Don and I were delighted to read your comment, and very excited for you. You must feel wonderfully free to have finally made the decision and set an intention in place. Don’t let anything talk you out of it! “Life’s too short!” I can’t recommend enough to write, over the next year particularly, when you get disheartened or doubtful – just get all that out on paper so you can be free of it. And then as you write further the good stuff starts to come. I wish you much courage and much joy. You’re doing the right thing. Blessings and happy travels. Hi Jamie – The ship is Galapagos Legend, run by Klein Tours. I was going to put a link to their website in the blog post but it appears to have been hacked by something Russian. Hopefully they will discover it soon and fix the problem. If you Google Klein Tours you’ll get a link to their website, but I’m not sure I’d recommend it. It went to something Russian and I had to shut down the computer. Other than that it doesn’t seem to have done any harm. Fingers crossed. This was nearly 2 months ago so maybe it’s okay now. galapagosislands.com is fine and offers many alternatives for tours of the islands, including those run by Klein Tours. One thing we loved about going in March is the water is really warm at that time of the year so we didn’t need wetsuits for swimming. You can Google for best times re climate and water temp. Also our ship provided wetsuits at extra cost. I don’t know if this would be available on smaller boats. Suggestions/hints – depends on how ‘rough’ you’re okay with, and how seaworthy you are. We chose the biggest ship available because we wanted something stable. You can go by yacht with only 16 people if you want to. We did have some ‘hanging around’ time with the change of passengers mid cruise (each segment with the Legend is a 4 day cruise) but we were okay with that. You mentioned that you had some friends Bhakti and Ram who helped you find an apartment and the like. Are you comfortable providing their contact information or could you direct me to others who may share the same credibility and could help me locate an apartment comparable to the one you and Don had? Hi Jamie, I will email our friends and see if they would comfortable with me sending you their email address. I’ll let you know. I haven’t received any other request from you so that’s a bit of a mystery. Hope you have a wonderful time in Tiru. Just found your site, what fun reading. Just curious do you have an entry blog somewhere describing your travel and packing habits? How much clothing are you packing and are you backpacking your things or rolling around a travel case or two? Also do you often base yourselves out of one location for an extended stay? We’re a mid sixties couple hoping to travel more but don’t care for moving to a new location every other day and like to keep our bags on the light side. Thanks so much for sharing your journey. We travel with carry-on size cases and medium-size day-packs (they’re college book bags so quite roomy but they are not full-size back packs). We now carry disinfectant gel rather than hand wipes (takes up much less room) and don’t carry mosquito nets since they seem to be always provided when necessary. Our cases are hard-shell spinners and can be expanded. Clothing is minimal. Rule of thumb is three of everything – one for washing, one for wearing, one for spare – socks, underwear, t-shirts, long-sleeve t-shirts, pants. We also have a padded jacket each that squishes down to nothing, and lightweight shells for rain. Travel habits: hmmm – that’s pretty broad. We like to stay at about the 3 star level – apartments, hotels, hostels (private room). We want our own bathroom, wifi, central location or close to easy local transport. Almost always we travel independently though we have recently done tours through Jordan and Egypt. We usually combine day tours with independent exploration. Day tours are great to get you oriented or if you don’t have much time. We do loads and loads of online research. We do a combination of more extended stays and being on the move. We *rarely* move to a new location every day, but from time to time may move every three days if we’re exploring a region – about three weeks of this is our limit and then we need to stop somewhere for a bit. followed by a one week tour of Jordan, followed by a 12 day tour of Egypt. The 2 months back in Vancouver, 3 months in San Miguel de Allende in Mexico, then two months in La Manzanilla Mexico then back to Vancouver where we are now housesitting until the end of October. Nov-Feb we plan to explore more of Mexico, Cuba, and Central America. Hope this helps. Good luck on your travels. Hi Alison. Love the blog, reading about your adventures is very inspirational! Can you share some advice about planning? What dictates your where you travel? How far in advance do you plan? When do you determine details like accommodation (or perhaps you just arrive and search?) and booking flights? Also, how do you cover off health care? We are retiring at the end of this year and are eager to begin a life of unfettered travel but a little overwhelmed with all the options and how to start Thanks so much for sharing your adventures! Deciding where – initially it was about the bucket list. Then it became about serendipity and the weather and the bucket list. The bucket never empties. The more we travel the more it gets filled so the biggest dictate these days is weather and the cost of living. We try to stay with warm weather, and we tend to avoid the really expensive countries. We mock up a ‘plan’ as often as 12 months in advance, but anything can change it. We don’t make and bookings until we’re really sure. It’s all very loosey goosey. It’s the no-plan plan for a while as we bounce around ideas. And then suddenly it’s time, a decision has been made and we start to make some bookings. We *always* have accommodation booked for when we first arrive anywhere, and a way to get from the airport/train station to our hotel. When we went to South America for 6 months all we had booked was an apartment in Buenos Aires for the first 3 weeks. We spent time there booking a 3 week trip around Patagonia. At the end of that we flew to Mendosa for 2 weeks and there booked the next forward movement north. Once on a continent we basically make it up and book it as we go along. We have Canadian health care coverage which we keep up to date. It means we have to be in BC for 5 months of every year. Apart from that we buy travel insurance if we’re going to developed western countries where health care is expensive. In third world countries we don’t bother with extra insurance because health care is so inexpensive that we just pay as we go. We can also claim it back from our Canadian coverage. We also have Medjet Assist which costs about $800 (Cdn) per year. This is repatriation coverage if either of us is hospitalized with illness of injury. Start with the countries you have always wanted to visit. Don’t try to book too much in advance – that’s what’s overwhelming. Just have a general idea and then book the first few days or couple of weeks and then make it up as you go. Trust the unfolding. And have a wonderful time! It will be more amazing than you can even imagine. Thank you Alison! Your information is very appreciated! We just returned from a quick 2 week “open-ended” vacation where i was able to put some of your advice to work. It was a good first foray; dipping my toes in the water, so to speak Now to go in a little deeper…. Thanks Nicole. Sounds like you had a good time dipping your toes in the water. May you dive right in! Travel is an incomparable experience. Somehow it opens you to an inner life that you never knew you had. May all your travels be wonderful! It’s so refreshing and reassuring to read you articles. I found the interview with you guys on Nomadic Matt. My husband and I are from Austin, TX and we are preparing our house to sell with the intention of doing much the same thing you are doing. We’re starting out in our car because we want to see many of the beautiful national parks in the U.S. But we have plans to start international travel in Ireland and Scotland, visit friends who are living in France and then see where that leads us. Thank you for inspiring us with your story! Thanks so much Prabhu. I don’t think you’ll regret it for a minute! We’re still having an amazing time even after five years. We still don’t have a home ad don’t miss it at all. We always have a roof over our head when we need it and that is enough. We’ve found that the more of the world we see the more we want to see. Wishing you all the best for all your travels wherever they may be. Alison, my dear, I’m very sorry to admit I hadn’t found the time to read your blog until today. Better late than never, though! I love your story. Beloved and I are a couple of years from (semi) retirement, and though we’ve set ourselves up a relatively modest life with early retirement in mind, we still don’t have enough saved to travel the way we’d like. Maybe someday, we’ll sell it all and pick up and wander the earth like you two do. You’re my new heroes! Thanks so much Donna! Selling everything to travel was the best thing we could have done. This article is now a few years old. We travelled, homeless by choice, for nearly six years in total. Then earlier this year we reestablished a home. For the first time in 6 years we own a car and furniture again. It’s another adjustment, but we are certainly not done travelling. I hope you get to do some of the travelling you would like to do. It’s so good for the soul! We’re planning on travelling to japan and China in May-June. It will be a whole new adventure.